Lithograph by L.H. de Rudder (1807-1881) after an original drawing of October 1841 by Prince Aleksandr Mikhailovich Saltuikov of the procession of the Goddess at Calcutta published in Paris in 1848. In Hindu tradition, Kali 'the black one' is the most terrifying of all the manifestations of Shiva's concort the Great Goddess. 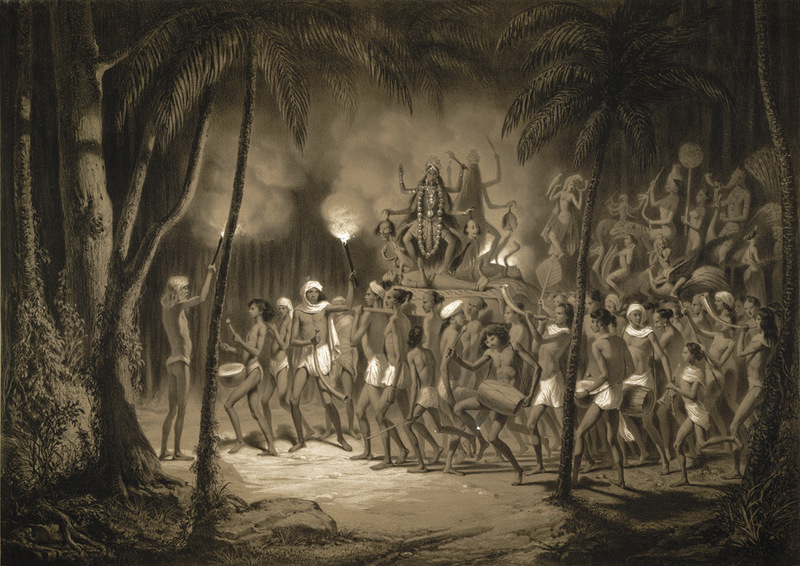 In this image, Kali is performing the dance of death on the body of Shiva. She wears a necklace of skulls and holds the heads of sacrificial victims in her hands. It is popularly thought that the name Calcutta derived from the Kalighat temple in the city that is dedicated to the goddess.